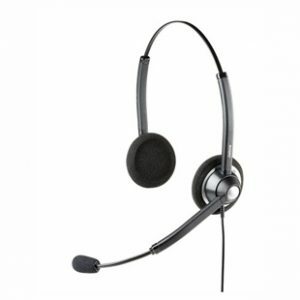 Designed for contact centre use, this biaural headset is cost-effective and does not compromise on quality. Features: Lightweight, sturdy design and professional quality; Noise-cancelling microphone for noisy environments; PeakStop technology that gives acoustic shock protection against sudden, loud noises; Boom arm with 290° rotation; Quick disconnect (QD) plug. Note: this headsets requires a bottom cable to work with your phone.